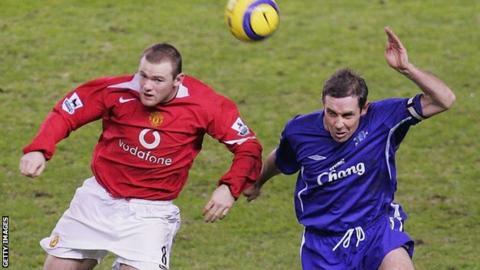 David Moyes will achieve great things as Manchester United manager, according to former Everton captain David Weir. Weir, 43, played under his fellow Scot for five years at Goodison Park before becoming part of his backroom staff. "The cream always rises to the top and he's definitely got all the attributes to be a great success," said Weir. "There's no doubt that he's going to be a success there, it's just a matter of the fans and club being patient, which I'm sure they will be." Moyes, 50, has had mixed fortunes since replacing Sir Alex Ferguson as manager at Old Trafford in the summer. I know he's going to enjoy every minute so it's great for him and great for everybody to see him back. United have lost five of their 16 Premier League games so far, but finished top of Champions League Group A comfortably to set up a last-16 tie against Olympiakos. And Weir expects Moyes to be given time to get things right on a consistent basis. "They're a good club," he told BBC Radio Scotland. "They've shown a track record of supporting their managers, looking after their managers and giving them time to develop. "They've been very sensible in their choices and they give the person who gets the job time. They obviously had a great result at the weekend and that'll help." United beat Aston Villa 3-0 at Villa Park on Sunday - and Weir was pleased to see former Scotland team-mate Darren Fletcher make his first-team comeback in the game. Midfielder Fletcher's previous appearance was on Boxing Day last year, before having surgery on a chronic bowel condition, and he is now in contention to play in Wednesday's League Cup quarter-final at Stoke. "It's great for Darren, it really is," said Weir. "He deserves it and he's a top player. I'm sure the manager will be delighted to have him back involved. He's obviously been through a lot of hardship in regard to his illness. "He's missed a lot of games so it's important he comes back and gets up to speed. I know he's going to enjoy every minute so it's great for him and great for everybody to see him back." Weir was appointed assistant manager at League One side Brentford on Monday, teaming up with new boss Mark Warburton following the departure of Uwe Rosler to Wigan. "He had a great time there so I spoke to him about that. He's got fond memories of Falkirk, as I have. That's how football works, it's a relatively small industry. Although it's far and wide, you always have a connection with somebody." The former Rangers defender was sacked by Sheffield United in October after only 13 games in charge, and has sympathy for those who have left their posts in the recent spate of managerial departures. "That seems to be the nature of the job now that it's a week-by-week profession," he said. "I don't think that's necessarily the best way to progress a football club but it seems to be the way the industry's going. "It's immediate success that people want and sometimes that's not necessarily the best thing." Brentford, who narrowly missed out on promotion to the Championship last season, are third in League One. "I've been down here in the past and had a look around," Weir added. "I know the good facilities and good people at the club. I'm just excited, it's just another opportunity for me to go and learn and develop and hopefully Brentford to continue to be successful. "It appeals to me to be working with Mark, who's a great guy and has got good knowledge. I think I can learn from him and I think I can help him as well."